Why Can’t Buses Be As Kind As People? Our next day on the road was almost uneventful, as least compared to the day before. Tim started up the bus at 8:30 am, with me still asleep -- for about 30 seconds. I had thought sleeping on our bus would have that familiar, comforting feeling, harkening back to all the snoozing I’d done on Greyhounds traveling back and forth to college. But, laying flat in a Queen bed in the very back of our bus was anything but reassuring. All of the turns, bumps and ruts were amplified. I felt like we were careening off the road during an earthquake while swerving to avoid Godzilla. I quickly got up, staying in my pajamas (so, there is a bright spot to this whole bus thing, after all). At first, I was glad I had, as the weather had cleared and the mountains ahead in Utah were stunning. But, once we got into those treacherous beasts, destroyers of already dwindling will with their "runaway truck lane" and "steep grade ahead" signs, I longed for the insecurity of the bed in the back. I tried to calm myself. I was being ridiculous. Tim started having trouble with the brakes. I asked what the matter was. "Nothing, sweetie," he reassured between clenched teeth. When Tim won't even tell me what's wrong, there's trouble. I clutched Morty to my frilly flannel chest (Shula was still, of course, huddled under the bed covers), imagining our imminent, fiery demise. Suddenly, Tim figured out the problem. Rather than turn the “Jake” brakes on high, he’d turned them off. As he later explained, diesel engines don’t normally slow with compression (i.e., when you take your foot off the gas in a car, it slows down. With a diesel engine, it just keeps going). Our diesel engine bus, however, was equipped with Jake brakes, (God bless you, Jacobs Company) a compression retarder that uses the engine itself to aid in controlling the vehicle. This allows the bus to slow without using the regular brakes, which would quickly overheat on such steep grades with such massive tonnage and eventually lose their ability to stop the bus at all. Not a good thing. To operate the Jake brakes, the driver toggles a switch with his left hand. Unfortunately, Tim had assumed that "up" was high, when in fact, "up" was off. “Much better, huh?” He laughed, after realizing his mistake. Yup. 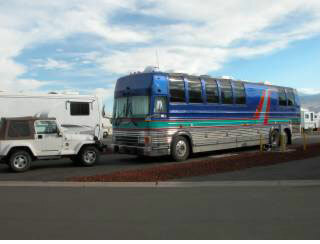 We arrived in Reno close to 8 pm and parked in front of his mother’s house for the night. Tomorrow, we would go to our first campground, but now, we were due at Tim’s brother’s house to join a birthday party for a niece. The bus door, however, would not lock. At some point during the conversion to a motor home, the large swinging handle a bus driver would normally use to close the door (which trips the air lock) was removed. Instead, we had a small button on the dash that activated said air lock (so small, in fact, Tim kept forgetting about it our first day). A regular, RV door lock was also installed, but when the door frame twists even slightly, it can pop open (as also demonstrated that first day). Since the air lock does not work when there's no power to the bus, we needed both systems. 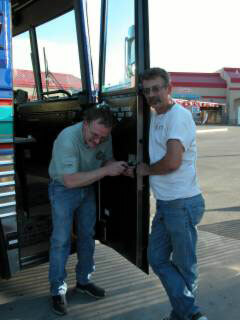 Tim got out his tools and took the door lock apart. While he did that, I worked on figuring out the ice maker in the fridge. I needed a martini. Bad. (Yeah, I know it's "badly," but I didn't need it "badly," I needed it bad, see?) While he got the lock working as well as he could, I saw that in fact, there were a few ice cubes already in the tray. Unfortunately, the manual said to discard this first set. Something about chemicals… dirt… growing a third eye… I didn’t know and didn’t care. I needed my Cosmo and I needed it. Bad. Soon, some nieces and nephews returned to drop Dorothy home from the party. They all came in for a look and were duly impressed. After the tour, Tim’s namesake nephew, a strapping 22 year old who I was close to, took me aside. “Yup,” was all I could reply, feeling no more pain, as I sucked down the last fruity, tranquilizing drop. The next morning, Sunday, brought with it a new day… and a new mattress. Dorothy’s birthday party went off without a hitch. I noted that one of Tim’s grandnieces, an adorable three year old named Ileana, wore a lovely blue satin frock for the occasion. I was even more impressed, however, when she chose a perfectly matching balloon to take home. Now there’s a girl who knows how to accessorize. Tim spent most of the rest of the day working on that darn door lock, this time with the help of his brother and nephew, while I spent the afternoon with Shula in bed. I still hadn’t been sleeping well and the party had been very early in the morning, the only reservation we could get for 20 people on Father’s Day. It was noon by now and I was still too wound up to sleep, even after days of sleep deprivation. I was strung out, on edge and way too wired. But, with only a couple of hours to nap before a family dinner, I was desperate. I sat on the floor of the kitchen and perused the liquor cabinet. I was too exhausted to put in much effort. Certainly, any violent motion, as was required by the martini shaker, was out of the question. But, what would taste acceptable on its own? Finally, I spied my prize. “Ah, Frangelico! Come here my nutty little friar friend,” I cooed. I had that monk unfrocked so fast, he didn’t know what was sucking the life out of him. I didn’t want to deal with dishes (we had forgotten dishwashing soap, anyway), so I just drank the sweet, hazelnut nectar straight out of the bottle, sitting right there on the floor. I grabbed his chocolaty, if misnamed buddy, Cream de Cacao (who isn't creamy at all. Why is that?) with my other hand, gulping it down as a chaser. Yum. Tim walked in to get a tool. “What are you doing?” he exclaimed, looking at his watch. I’m not a big drinker. I’ll have a cocktail on the weekends, maybe a glass of wine with dinner then, too, but that’s about it. Here it was, noon on a Sunday and I was well on the road to getting soused. On the road. Oh, God. Better have another. While I napped, Tim thought he fixed the lock well enough to hold us until we could get to an RV service place, so we drove over to our first campground for the night. I was so looking forward to my first real shower in three days. Unfortunately, the water wasn’t hot, or even particularly warm. Apparently, even when hooked up to shore lines, we still needed diesel fuel to heat the water to a reasonable temperature, as we didn't have a hot water tank. After nearly a thousand miles since we last filled up, we just didn’t have enough left. So, we splashed around as best we could and went to bed. The next morning, after another fairly sleepless night (we couldn’t figure out how to get the fan in the bedroom to stop cycling until morning. The communications guy was supposed to have installed a noise machine, but guess what?) Tim went to do errands with his mother. I decided to fire up the internet for the first time. At least, as I lived this new, Spartan, chaotic and at times terrifying life for an entire year, I didn’t have to completely give up my old one. The internet was my link to friends, family and everything I'd left behind. I also needed it to do my insurance review work, something I was actually looking forward to getting back to that day, as it would provide some sense of normalcy. But, the satellite wasn’t working. I called tech support and discovered that our communications guy had not installed a crucial bit of software. Big surprise. Of course, the only way to install it was to download it. But, I had no internet. I was now over the edge, careening into a deep gully, and the engine wasn't even on. I climbed over Shula into the bed and had a good bawl. Sometimes, that’s just what a Princess has gotta do. After a few minutes, I splashed some very cold water on my face, grabbed a floppy disc and ventured outside, searching for someone with the same satellite antenna on the roof of their rig. I quickly found one and knocked. An older lady peered out the door. She was very kind. In spite of how crazed and desperate I seemed (well, she did have a Doberman in her rig) she let me in, got on the internet and downloaded the program I needed. I thanked her profusely. “You have no idea what a kindness you’ve done here. Thank you,” I said. She reassured me that her shakedown cruise, years ago, had been no picnic, either. Tim returned soon after and wanted to head out to gas up so that we could have a proper shower. I kept procrastinating, terrified of some new disaster. “Honey,” he said, “the filling station is less than a mile down the road. It’ll be fine.” I took a deep breath. “O.K.” We got to the pump at 4:30 pm. We left close to 8. While I went in to prepay, Tim went out to wash the windows... then couldn’t get back in. The door lock had totally jammed. A couple of mechanics came over to help. They and Tim worked on it for nearly an hour, without a budge. All I had was my wallet. Fortunately, Tim had his cell phone. I called AAA. They sent out the most manic mechanic I had ever seen, and in my line of work, I can assure you I’ve seen a few. Although he talked a mile a minute, flew around his truck getting tools and was a whirl of activity around the lock itself, (although I'm still not exactly sure what he did) he just couldn’t get it open. The pets were inside in the sweltering heat. Tim proposed breaking the glass on one of the small slider windows. I looked up from my 5’3”, 116 pound frame to his just over 6’, 175 pound one. “Do you really think I can fit through that?” I asked, incredulous. Hardly placated, I nevertheless turned to the task at hand, filing his remark away on the complaint form for the mythical home office I had concocted in my head, so I wouldn’t feel we were so very out there, totally on our own. There, “insulting passenger” joined, "nearly killed passenger," "nearly killed passenger," and "nearly killed passenger." Maybe they would consider replacing the driver. Several former bus drivers (and possible candidates) approached during that particular ordeal, offering advice and assistance. Finally, someone looked up the number of a locksmith down the street. I called. He could be there in 15 min. When John Smith and Steve Lauricella of ABC Lock and Glass arrived, they were like something out of an Abbott and Costello routine. “Don’t pick the lock. He says he has a key,” John said to Steve, nodding over to Tim. “Oh, that wouldn’t be too bright, would it?” replied Steve, still picking the lock. “You said you wouldn’t do it,” said John, “but you’re still doin’ it.” Steve shook his head, while still picking the lock. “No, I’m not,” he replied. They were not inspiring much confidence. I burst into tears. John immediately spun around, looked me in the eyes and said, “I will not leave here until you get into your bus.” I immediately stopped crying and gave him a weak smile. Tim told me to take a walk with him. “Honey, I am so sorry for dragging you on this trip. This whole bus thing was my idea. I can't believe I'm putting you through all this." I knew how much this year meant to him. “Look, it was your dream, but I don’t blame you. I did agree to it. And,” I lied, “I’m not ready to throw in the towel just yet.” He gave me a dubious look, but we returned to our own private comedy team. As they worked, we started telling them about all our mishaps. Steve kept saying how envious he was that we were doing this for a year. Tim kept saying if he was so envious, he was sure I’d give him a great price on the bus. After about an hour, they got it open. I ran in and checked on the pets. When I got out, Steve was getting the bill ready. “For the bus?” I exclaimed. “Sold!” They all laughed. Only, I wasn’t joking. John promised he’d come by the next morning to permanently fix the lock. They ended up sending someone else as John had quit. I'll always wonder if seeing a grown psychiatrist cry is simply too much for any human being. By the time we got back to the campground, it was too late to go out to dinner with Tim’s mother. I got into the shower first. “You’re sure I can use all the hot water I want without taking away from your shower?” I asked Tim. He assured me that was the case. It felt so good to wash my hair for -- I hate to admit it -- the first time in four days. As soon as I finished, Tim stepped in and soaped up. The water stopped. All over the bus. “It’s truly unfortunate how little pleasure that gives me at this time,” I replied. We got dressed and went over to the casino next door for a quick supper. I ordered a Marguerita. “12 or 24 ounce?” the bartender asked. I asked her to point out the 24 ounce size. It was gargantuan. There was no way I could finish it, so I ordered the 12. Five minutes later, I had downed that little strawberry sucker and was back at the bar for its towering sibling. When Tim saw me return with it, his eyes grew wide. They grew wider still when I downed it. Quickly. Tim was up all night with food poisoning. His mother apparently had it, too. They must have gotten it while out that day for lunch. Mercifully, I was spared. For now. This page contains a single entry from the blog posted on July 1, 2004 5:12 PM. The previous post in this blog was After the First Day. The next post in this blog is Random Selection.